I was rummaging through old photos today while doing some spring cleaning. While the title of this blog is "Paul Hembree | composer," I'm somewhat uncomfortable representing myself as only what my college degrees and artistic ambitions say I am. I remember doing some research for an arts entrepreneurship class in 2006 or 07 and finding that most artists (not just musicians) of various types "moonlight" in other professions to pay the bills (not exactly a surprise, but the National Endowment for the Arts had some interesting hard numbers on the subject). Frank Zappa's Step Number 5 in "Simple Instructions [to be a composer]" is "get a part-time job so you can continue to do stuff like this" (Zappa & Occhiogrosso 162). 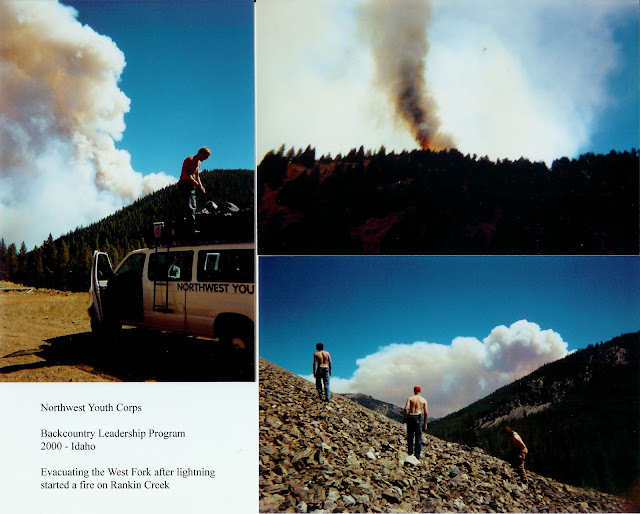 From 1998 to 2003 I worked almost ever summer doing trail work for either the Student Conservation Association or the Northwest Youth Corps, and in 2009 I worked for the Boulder County Youth Corps. In both 2003 and 2009 I was a crew leader. It is considerably different dealing with high school age kids, as their boss, in a manual labor setting, compared to dealing with college undergraduates, as their instructor, in music technology or theory education settings. Both are extremely rewarding, but in different ways. I still haven't quite figured out how to convolve these paradigms... maybe manual labor in the morning and music education in the evening? An arts education / trail work summer gulag? I'd like to scan some of the best photos over the next several months, if only to bathe in the nostalgia and remember some truly incredible people. 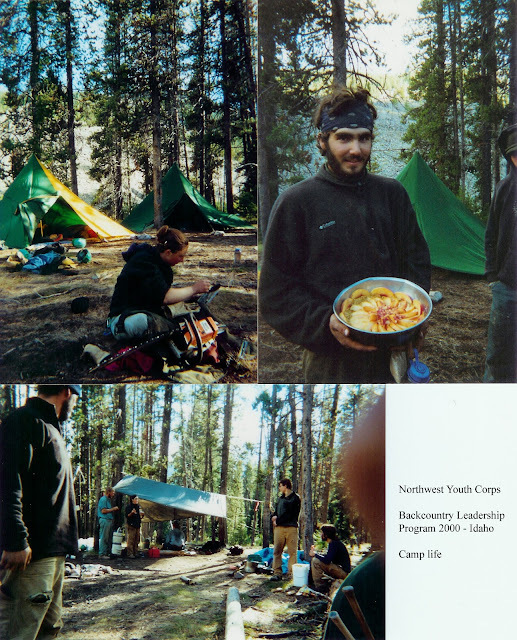 Below are some of the highlights of NYC's Backcountry Leadership Program, 2000, on the West Fork of the Yankee Fork of the Salmon River, in Idaho. 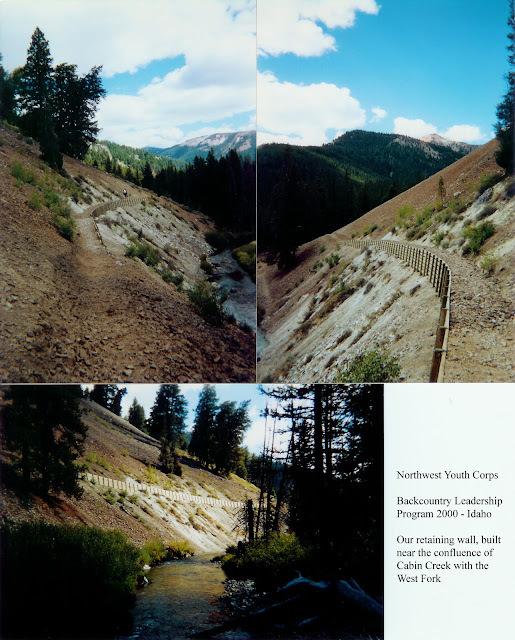 Though the main work-site, where we built the large retaining wall pictured below, was outside of the Frank Church River of No Return Wilderness Area (which allowed us to use small power-tools - a drill and a chainsaw), we were still eight miles in the backcountry, only accessible by foot. The Rankin Fire, pictured at bottom, was in an adjacent valley, and started after an incredible thunderstorm the previous day. We hiked out those eight miles very quickly, but once we reached our van, our exit route down the Yankee Fork to Stanley was blocked by the fire, forcing us to take a long way around through Challis. Luckily none of our work was destroyed in the fire.